Those who witnessed Phil Schiller’s keynote presentation at Macworld Expo Tuesday got a taste of what’s new in GarageBand, iLife ’09’s music-, podcast-, and now instructional audio application. GarageBand ’09 won’t be out until later in January, along with the rest of the iLife ’09 suite. But we’ve done some digging to find out more about the new version of iLife’s music component—some of which comes from the keynote, and some of which may be new to you. The focus of Tuesday’s presentation was the music instruction aspect of the new, still-in-beta version of GarageBand. As demonstrated by Mr. Schiller, GarageBand includes guitar and keyboard lessons, and these lessons are offered in two components—Basic Lessons and Artist Lessons. As the name implies, the first offers instruction on the basics of playing that instrument—learning where particular notes are, forming chords, and playing rhythms, for example. The latter are music lessons that include an artist who teaches you how to play both the simple and advanced version of a song they’ve made famous (Sting showing you what chords to use with "Roxanne," for example). Learn how to play the riff at the end of the chorus to ”Brick,” directly from Ben Folds. There’s more to these lessons than what Schiller demonstrated before his keynote audience. For example, you have the option to view information in a variety of ways. In a guitar lesson, you can view not only the instructor and fretboard, but also view chords, tabs, and lyrics, for example. If you’re a left-handed guitar player, you can see the fretboard in that orientation. In a keyboard lesson you can see notation—bass clef alone, treble clef alone, or both clefs on the grand staff. The videos can also take advantage of multiple views. You might, for instant, wish to focus on what a guitar player’s left hand is doing. You also have the opportunity to mix what you hear. For example, you can listen to only the instrument without the instructor’s voice. 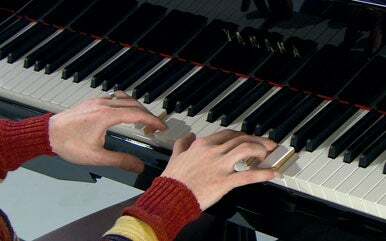 Additionally, in an Artist Lesson, you can mute the band or mix the volume levels of the individual instruments. Lessons aren’t all that’s new to GarageBand ’09. To begin with, the interface has been reworked so it’s less cluttered. The Loop Browser no longer appears at the bottom of the GarageBand window; instead, it's incorporated in the pane to the right that you can expose or hide. The effects area is now more graphically rich and the overall color scheme is along the lines of Apple’s Aperture and Logic—gray rather than the old black text on a white background. The new version of GarageBand extends the number of project templates available to you. You also have more template options when starting a new project. In the past, for example, when you launched a new Podcast project, the GarageBand window filled with appropriate empty tracks—Podcast, Male and Female Voice, and Jingles. 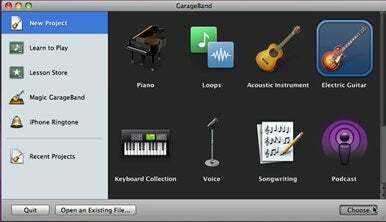 GarageBand ’09 extends those templates to include Piano, Loops, Acoustic Guitar, Electric Guitar, Keyboard Collection, Voice, Songwriting, and Podcast. Choose one of these project types and GarageBand’s window is populated with appropriate tracks. Use knob-like controls to adjust volume, tone, and on-board effects with GarageBand ’09’s amps. GarageBand ’09 also emphasizes the program’s ability to model guitar amplifiers and effects. Although you could select different amplifier models in previous versions of GarageBand, the means for doing so wasn’t nearly as intuitive as it is in GarageBand ’09. With an interface element reminiscent of Magic GarageBand, you choose from among five amp models—amps similar to the tones you’d get from amps made by Fender, Marshall, and Vox. After you’ve selected an amp you can adjust its parameters—volume, tone, and on-board effects such as spring reverb—with controls that look like the knobs found on the original amp. Guitar and bass players use stomp boxes to add effects to their sound. In GarageBand ’09, so will you. 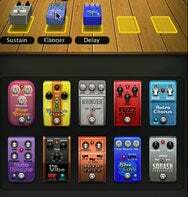 Instead of choosing effects from a pop-up menu you select “stomp boxes”—small gadgets guitar and bass players use to add effects such as reverb, chorus, and delay to their sound. To add a stomp box, just select one from a collection in the pane and drag it into one of the five positions reserved for these boxes. When you click on a stomp box you can then configure its settings. To replace a stomp box, just drag a new one on top of one already occupying a slot. Finally, GarageBand ’09 bears an enhanced version of Magic GarageBand, the feature that lets you play along with a virtual band. In this version of GarageBand not only can you jam with the band as you could in the past, but you can now also record your performance. In addition you can mix the levels of the various instruments that appear in the band. As noted above, GarageBand ’09 and its iLife compatriots will be released at the end of January. We’ll have more details about the updated version once it arrives.